Japan's Prime Minister Shinzo Abe speaks during a press conference at the prime minister's official residence in Tokyo, Sept. 25, 2017. Japanese Prime Minister Shinzo Abe has announced an early election to capitalize on rising public support for his hard-line stance against the North Korean nuclear and missile threat. The prime minister Monday dissolved the lower house of the Japanese parliament known as the Diet, and called what is known as a snap election for October 22, more than a year before the next election is scheduled to take place. At a press conference to announce his decision, Abe said engaging in a snap election campaign would not distract his government from responding to North Korean threats, and he pledged to increase pressure if Pyongyang fails to halt its provocations. Calling an early election is an often-used political tactic in a parliamentary system to try to gain more seats in the legislature, or extend the ruling coalition’s term of office, when public support for the leadership is high. If Abe’s Liberal Democratic Party maintains its majority in the Diet, he could serve as prime minister until 2021. Abe is seeking to take advantage of his close to 50 percent approval rating in recent public opinion polls. Just a few months ago his rating dropped to near 30 percent due to domestic scandals alleging he used his office to help friends and family profit, charges that he denied. But in the face of North Korea’s continued threatening behavior, the Japanese public has increasingly coalesced in favor of the conservative prime minister’s strong defensive posture. FILE - A pedestrian looks at a television screen displaying a map of Japan, right, and the Korean Peninsula in Tokyo, following a North Korean missile test that passed over Japan, Sept. 15, 2017. On two recent occasions Pyongyang fired missiles over the northern island of Hokkaido and has threatened to "sink" Japan into the sea. On Friday, North Korean Foreign Minister Ri Yong-ho said his country is considering testing a hydrogen bomb test in the Pacific Ocean. 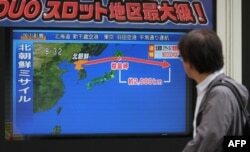 Analysts say such a test would likely be a nuclear tipped missile launch that would also fly over Japanese airspace. 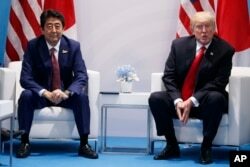 Abe has closely aligned with U.S. President Donald Trump’s maximum pressure policy to use crippling sanctions and the threat of military action to force the Kim Jong Un government to give up its nuclear program. FILE - President Donald Trump, right, speaks during a meeting with Japanese Prime Minister Shinzo Abe at the G20 Summit, July 8, 2017, in Hamburg, Germany. 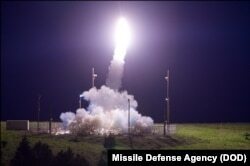 The Abe administration has also advocated for bolstering Japan’s missile strike capability, and has proposed a $48 billion budget to upgrade missile defense systems, including purchasing U.S. land-based Aegis Ashore interceptors or the Terminal High-Altitude Area Defense (THAAD), the same anti-missile system the U.S. recently deployed in South Korea. FILE - A Terminal High Altitude Area Defense (THAAD) interceptor is launched from the Pacific Spaceport Complex Alaska in Kodiak, Alaska, during Flight Test THAAD (FTT)-18, July 11, 2017. If Japan seeks to acquire THAAD it could risk angering China, which strongly objects to locating this system in the region, as its powerful radar can potentially monitor Chinese military installations. Beijing has retaliated against Seoul for THADD by reducing imports and tourists, and could also try to punish Tokyo in a similar fashion. Growing Japanese support for strong defensive measures could also help Abe achieve his long held goal to end constraints imposed on the military by the country’s post World War II pacifist constitution. To change the constitution that prohibits Japan from going to war to settle international disputes requires the approval of a two-thirds majority in parliament, and the support of a majority of voters in a national referendum. FILE - Japanese Prime Minister Shinzo Abe, center standing, reviews members of Japan Self-Defense Forces (SDF) during the Self-Defense Forces Day at Asaka Base, north of Tokyo, Oct. 23, 2016. 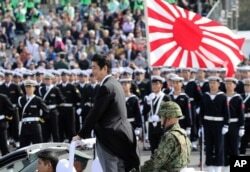 The Japanese public has been divided over Abe’s proposal to allow the military more latitude to counter potential threats from countries like North Korea and China that are increasing their military and nuclear capabilities. The U.S. supports Japan taking a more prominent role in maintaining regional security. Supporters of the pacifist constitution argue that loosening restrictions on the use of force will entangle Japan in international conflicts, most likely in support of its U.S. military ally. President Trump’s recent threat to totally destroy North Korea if attacked, and the escalating war of words between the leaders of the U.S. and North Korea, have heightened these concerns for many. “Quite a few people also regard that as more of courting danger to Japan, and putting them in harms way, rather than protecting Japan,” said Koichi Nakano, a political science professor with Sophia University in Tokyo. China and other countries in Asia that suffered under Japanese occupation during World War II also object to any change to the country’s pacifist constitution. A Nikkei business daily survey showed 44 percent of voters plan to vote for Abe's Liberal Democratic Party versus 8 percent for the main opposition Democratic Party. However recent elections around the world have surprised pollsters with unexpected results. While the opposition in Japan currently seems divided and weak, Abe’s critics say he runs the risk of alienating voters by playing politics at time when the country faces a serious security threat. “Some people are really sort of cynical about the fact that Mr. Abe has been basically calling the nation to duck and cover while North Korea launches a missile, and now calls a snap election presumably because it’s okay to conduct a political campaign even when North Korea is flying missiles,” said Nakano. A poll by the Kyodo news agency found that almost two-thirds of Japanese voters are opposed to Abe holding a snap election, and that 42 percent of the electorate is undecided about whom to support.